I have a problem on last step, seems texture passing as additional channel is not rendered with shader. however it's ok in image. 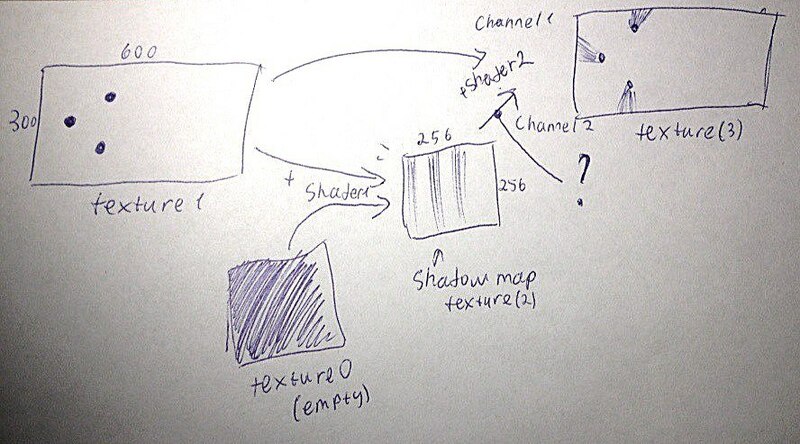 I take texture0, apply shader to it (texture1 as an additional channel), to get shadowmap. Then i want to take texture1, apply shader2 to it, with texture2 (given by shader as additional channel) to get shadows from objects. Problem at the question mark -- instead of getting texture2 (processed by shader1) i get texture0 (still unprocessed). I want to get rendered texture2 in my shader2. I have a Unity addon that generates noise via a shader. How can I use it besides just dragging it onto a mesh?